What secrets connect Egypt's Great Pyramids, the Freemasons, and the Council on Foreign Relations? In this astonishing book, celebrated journalist Jim Marrs examines the world's most closely guarded secrets, tracing the history of clandestine societies and the power they have wielded – from the ancient mysteries to modern–day conspiracy theories. Searching for truth, he uncovers disturbing evidence that the real movers and shakers of the world collude covertly to start and stop wars, manipulate stock markets, maintain class distinctions, and even censor the news. Provocative and utterly compelling, Rule by Secrecy offers a singular worldview that may explain who we are, where we came from, and where we are going. “ This is an excellent book. I have studied a number of works on this subject matter and found this one to be the most well-organized, comprehensive and understandable. 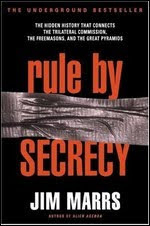 "Rule By Secrecy" is written in such a way that it is easily digestable and a great read for anyone who questions reality even a little bit. Skeptics find this work and others like it confrontive and threatening because they demand "proof". Well, that is an illusion because the "powers that be" manufacture proof on a daily basis through the media. Please consider that if you are addicted to a steady diet of newspapers and/or watching the news daily, you are perhaps being influenced by only a few (of many) very powerful forms of mind control. When you begin to wake up and question the way things are your heart will provide you real proof. The ability to think and discern using your intuition and feeling nature is the only true freedom there is.